The most obvious reason to grow vegies or herbs is to harvest and use them but that isn’t the only reason. Traditionally the home vegetable patch has been restricted to the far corner of the backyard where it is out of sight, but with a little thought given to design, vegetables can be used as key features in the ornamental garden. 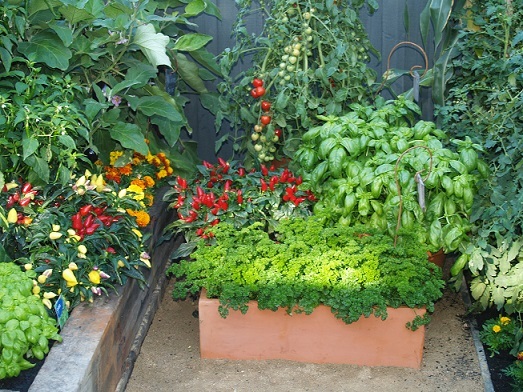 Many vegetables and herbs can be just as attractive as the plants we grow. Using herbs and vegies for better visual impact is simply a matter of plant selection and arrangement. There are endless possibilities of combinations – a task made easier each season’s release of exciting new compact and colourful varieties. Formal vegetable gardens – also called Potagers, the concept of growing vegetables and ornamentals in stylised, formal beds separated by paths originated in France. The beds are usually edged with a clipped low-growing hedge, and often feature standard plants (such as standard roses) or formal topiary plants in the centre of the garden or on the corners of the beds. In some cases, religious symbols were incorporated into the design of such gardens. Grow a colourful vegetable garden – choose one or two main colours for contrast or harmony and plan for seasonal colour effects. For example, plant parsley borders around coloured foliage vegetables such as kale, chard or a coloured lettuce. Use hedging – hedges can be informal or formal, but generally the best hedges for vegetable gardens are multi-functional: they shelter the growing beds, they provide a sense of year-round structure and permanence to the garden, they screen the garden from view, and they give flowers, fruits or nuts. Depending on the climate and garden style, lavender, rugosa roses, rosemary, hazelnuts, lilly pillies and dwarf apples or citrus make useful and attractive hedges. Use attractive climbing frames and trellises – there are many different ready-made structures available for supporting climbing plants, or you can make your own. A bamboo or metal tripod is an attractive support for peas, beans and other climbing plants. Add a water feature – traditional features such as a timber half-barrel or old-fashioned water pump are often used enhance the vegie garden. You can even grow interesting edible plants such as watercress or water spinach in such a pot. Designing your own garden can be one of the most creative things you will ever do – a living sculpture that gives you years of enjoyment. The secret to good garden design is a well thought-out plan. This involves carefully assessing and analysing the site, deciding what you want to include in the garden, then matching your ideas with the capability of the site to come up with a satisfactory garden concept. The initial plan will help you decide where your vegetable garden should best be placed for maximum sunlight, proximity to taps and compost bins, and ready access from the kitchen, as well as for the best visual impact. Further plans can be made if necessary. If you are planning a new garden, or revising your current layout, you may choose to create individual concept plans for different areas or ‘rooms’ within the garden. Some areas may require more detailed plans to provide information about planting schemes. To effectively build large or heavily constructed landscapes or to install a large irrigation system it may be necessary to have accurate scale plans of the site to ensure that the concept is properly translated into reality. Think of your garden as being made up of rooms. Just like your house, each room should have a particular purpose: the lounge room indoors is the place you entertain guests; the patio outside may be the place you also entertain guests. The laundry inside is where you deal with cleaning clothes: the washing line outside is also where you deal with cleaning clothes. If you want a house that is both functional and attractive, you build a wall between the lounge and laundry; and if you want a garden that is functional and attractive, you also block the view between the patio and washing line. In most circumstances though, the home gardener will not need to go into any great technical detail, and even the backs of a couple of envelopes will do. If you intend to design and construct the garden yourself it is also wise to keep the design within your capabilities. Start with a small space and extend once you have gained confidence. It is far more pleasurable to have a small garden thriving than a larger garden that is overgrown. Easements, caveats and utilities – are there legal restrictions on what you can do and where you can build? Look for gas, electricity, phone and water connections. Buildings and hard surfaces – are there sheds, paved areas, garden beds, etc? Topography and access – is there a slope or a change in levels? Can vehicles or pedestrians move freely? Orientation, seasonal issues – does the house shade parts of the garden? Do deciduous plants let in light during winter? Does one part of the house or garden get hot in summer? These are especially important issues for planning a vegetable garden. Climate – where are the prevailing winds? When and how much does it rain? How often do you get frosts? etc. Atmosphere – is there any noise or air pollution? Vegetation – are there existing trees or shrubs you want to retain? Re-usable materials – are there any pavers, timber, etc. on site? Local area – what are the surrounding gardens like? Are there likely to be any future building works (extra rooms, new garage, etc)? What sort of atmosphere do you want to create? A private garden? A rural garden? A formal garden? A contemporary garden? Privacy – do you want the garden for entertainment or for peace and quiet? Views, focal points – where are you going to look at the garden? Is there a view you want to hide? Traffic – do you need room for cars? Will pedestrians trample the lawn? Children and pets – do you need room for ball games or for the dog to play? What sort of plants do you like? What sort of plants don’t you like? Do you want to include an irrigation system? Do you need a clothes line? Budget – how much do you want to spend? 2. Use paper to draw a plan of the existing garden features. Graph paper can assist if you are drawing a plan to an accurate scale, but is not always necessary. Consider making a few photocopies of this base plan so you can experiment with different designs. On one copy, include the direction of the sun, the views from the house, location of taps for watering the garden, and any other important information from your site analysis. This will help you see the limitations of the site. 5. With a pencil and eraser use your base plan to make drawings of possible garden designs. Don’t be afraid to experiment. The idea is to see what will work and what is impractical.